Yes, you guessed it. It was awhile ago, as the walkman slightly ages me a bit. I was a kid and everything was new and an adventure. My heart would skip a beat when a castle jutted out of a hilltop or an ancient villa could be seen fleetingly through fields of wheat. I wanted to leap off the train and go there. Who lives here and could I stay for a bit? As I got older, my childhood enthusiasm dwindled and I began to look at these historical dwellings with a business objective. Wouldn’t it be grand to vacation at one of these places and pick Sangiovese grapes for Chianti or plump green olives for virgin olive oil? I would even shop for produce at the local mercato and sip on chilled Vinsanto on balmy afternoons under the magnolia. My daydreams swept through me as quickly as the train roared down the tracks. What a great concept if could I find someone to invest in my idea! 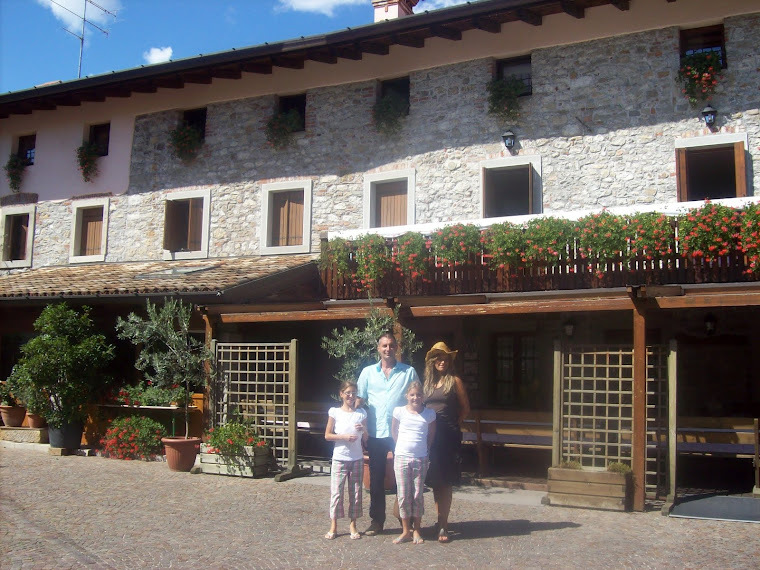 It wasn’t until many years later that I learned of the Agriturismo. The dernier cris in Italian vacations isn’t the bus tour from Rome to Florence or the port of call from Sicily to the island of Capri, but instead a tranquil sojourn at a countryside agriturismo. The idea of a more relaxed European holiday at an Italian country estate may be just as appealing as sunbathing on the white beaches of Barbados. The word agriturismo comes from condensing the two Italian words, agricultura and turismo, agriculture and tourism. The Industrial Revolution was the catalyst for the growth of urban centres and was partly responsible for the mass exodus of Italy’s predominant rural population to either large cities or foreign countries where greater economical opportunities lay waiting. Many old villas, castles and farm houses that were abandoned for town life or simply for their sheer high cost of maintenance, are currently being restored, thus providing a new option for tourists. For anyone who wishes to learn the grass roots of Italian culture, this is it. Contrary to the constant snapping of photos, feeding an insatiable appetite at the trattoria or purchasing a miniature David statue at a Florentine piazza, this type of holiday serves a different purpose. These lodgings, although set in a rustic ambient, can offer the lap of luxury and a wide array of extracurricular activities. This holiday could be the inspiration you needed to start sketching again, while taking in the panoramic view on a balcony, overlooking the Umbrian hills. Perhaps you would prefer spending your morning writing your latest novel in the courtyard of a medieval castello and afterward taking a drive into the city for some shopping. I could imagine myself cooling off with a daily swim at a Piedmont farmhouse after endless hours in the vineyard tending to the Nebbiolo. Later, I would spend an enchanting evening dining al fresco, discussing the harvest amongst amici, with only the light glow of the patio lanterns on our faces. Someone like my friend, Josie would go horseback riding at the break of dawn and then later, get a lesson in the culinary arts from the hotel chef, who happens to be Signora Rosa, the gardener’s mother. This type of holiday will cater to all your tastes. Tony and I visited one such place on a trip we took through the Tuscan hills several years back. Villa Micchi was situated on the outskirts of the ancient Roman and later, city-state of Lucca. We were given a tour through the estate by the owner and he showed us his vast vineyards and cantinas full of cured meats, cheeses and of course, wine. We were told that Carlo Collodi had written Pinnocchio in the valley below and proudly stated that it was the most widely read book in the world, after the Bible and the Koran. The local history can be just as intriguing as the story of any metropolis! I always considered those whirlwind vacations consisting of visiting five countries within a week to be utter madness. Since you have little time, interaction with the locals is limited and you experience only a small fraction of the culture. You are briefed on the area’s history and the only memories you have are those of the photos you asked strangers to take of you. It would have been more cost effective to purchase some computer software that could superimpose you standing by the Leaning Tower of Pisa. The frenetic pace and time management required in order to adhere to the planned agenda can be exhausting. True inspiration and peace can be found in the simplest of things. One can travel physically and spiritually to a place and to a period where the concept of time means little. It is comforting to know that while I was travelling via rail all those years ago, there were other like-people out there in the countryside who were working on making this daydream reality.